Parade All-American and Nations Keeper of the Year in 1979 for St. John Vianney’s first state championship, Chris’s talents were headed to Indiana University on a full scholarship. Chris was the starting keeper in his first two years at Indiana, and an integral part of the team during his final two years. As a member of the Indiana Team, Chris made it to the Division 1 Finals in 1980 and in 1982 and 1983 was a part of two Division 1 National Championships Teams. Chris is currently ranked number 8th in NCAA Goals Against average with a minimum of 2500 minutes, Chris had 5042 minutes played. On Indiana’s records, 5th in saves, 7th in shut-outs, 10th in victories, 14th in Season saves, 13th in Season shutouts, 7th in Season victories, and still holds the record for a Freshman with 68 Saves. As a professional, Chris had signed to play for the St. Louis Steamers, Louisville Thunder, and the Minnesota Strikers, but playing time was limited. On his return to St. Louis, Chris found his talents best used by the Imo’s team, Busch S.C., and Michelob S.C. taking the club to a regional championship. 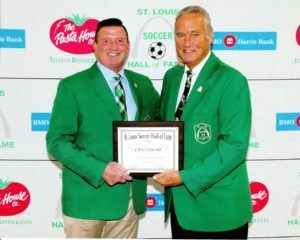 Chris has been the one to give back to the soccer community, volunteering his time to the keepers at St. John Vianney and Chaminade. Coaching youth teams at St. Catherine, and occasionally giving private lessons to young keepers along with being a volunteer for the Special Olympics.